The charming Kapoor(Shahid Kapoor), who was once being hailed as the future sitara has been facing a rough patch since past few years. His last hit, Badmaash Company, had come in 2008 and since then, lady luck hasn’t been so kind to him. Mausam, Teri Meri Kahaani and Phata Poster Nikla Hero, all of them Was Just nothing And brought a dent to his career. 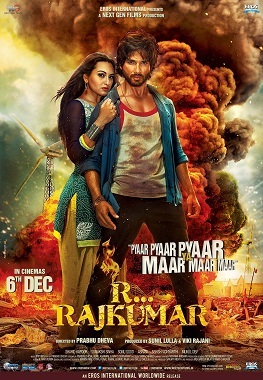 But then comes R… Rajkumar to the rescue. True to say, Rambo Rajkumar could have been a much better title for the movie. Reason, when it came to the big screen, it made a really impressive business at the box-office. The masaledaar movie, R… Rajkumar, that made approx 29.50 cr in its first weekend is Shahid’s biggest opening till date. Directed by Prabhu Deva, the movie is doing well in its targeted circuits. It performed exceedingly well in Mumbai, CP Berar, CI, Rajasthan, Bihar and South. Though in North India and Delhi, the film did not fare well, the overall performance was satisfactory. So enough though the movie will be no near to the 100 crore club, it is all set to become the biggest hit of Shahid’s career, something in the tune of 70 cr. For now, all we can say is congrats and all the best, Shahid!